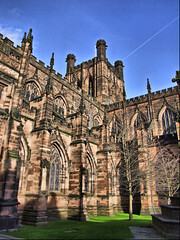 Tomorrow lunchtime I’m due to catch a plane over to England, to join a group called the Rivelin Singers in a singing week in Chester Cathedral. We are singing all the daily services throughout the week; deputising for the cathedral choir, who are on their summer break. I’ve never sung with this particular group before, but I know the choir’s director Fraser Wilson very well. He’s a former organ scholar of Christ Church, and is now the Director of Music at St Bartholomew’s Church, Ballsbridge, Dublin. The pattern of the week seems to be a morning of rehearsals, then some time off after lunch, a final rehearsal in the cathedral, and then Evensong. We then have our evenings spare to explore and enjoy Chester’s night-life. As such, it seems to be a similar format to the RSCM summer courses I used to attend. Anyway, I’m very much looking forward to my trip away. The Christ Church Cathedral choir have been on holiday for 3 weeks now, and I’ve been missing the opportunity to sing on a regular basis. Please let me know more about the event when it will be and how people can attend and I will put it on our Chester Whats on Guide.